A little blog update really. Couture. What does it really mean? We talk about couture clothing and think of beautiful creations I am sure, but is it just a posh word? I sew at home, I love sewing and make a lot of clothes. I have many, many books about sewing and fashion, many of them include the word ‘couture’. It is very posh, very special…..or so it seems. Couture, literally means ‘sewing’ in French. Well surely thats what we all do? If we sew something it is couture? When I sew I want people to look at the garment and say “How nice”, “Oh that’s lovely” “Wow” etc.etc. and above all not think it is ‘homemade’, surely thats what we all want? I wouldn’t wear something that clearly looks ‘homemade’ (note I didn’t say Hand-made!). We spend hours perfecting our techniques to make things look professionally made. We know we worry about that one seam that isn’t quite straight! (I know I do) but why? When we make things we do it because we love doing it. We love to make things people like and we love it even more when they find out you made it! Couture is Sewing! That’s what we do and regardless of what we think it is nothing more than a word! I started making a jacket yesterday. Lovely blue Welsh wool and decided to make it ‘couture’. 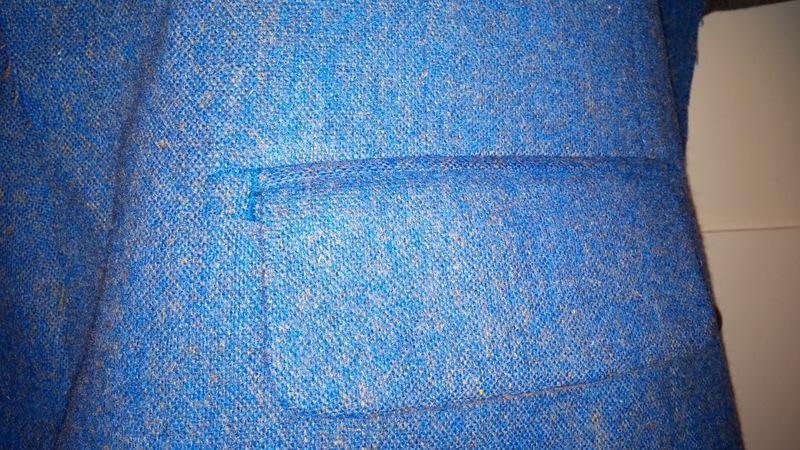 Well I have drafted the pattern, cut it out and put in the welt pockets. I hand stitched the welts and put D bar tacks at the end of each. Why? Because it made me feel good. It won’t make my jacket any better…..People will still say they like it. Does it make my jacket ‘Couture’? It is designed to fit me and my pattern so I guess it is. Right I’m off to ‘couture’ some more…..
Other news this week. I have made the Minerva Crafts Bloggers Network with my first make. The autumn ‘Shacket’ check it out here. 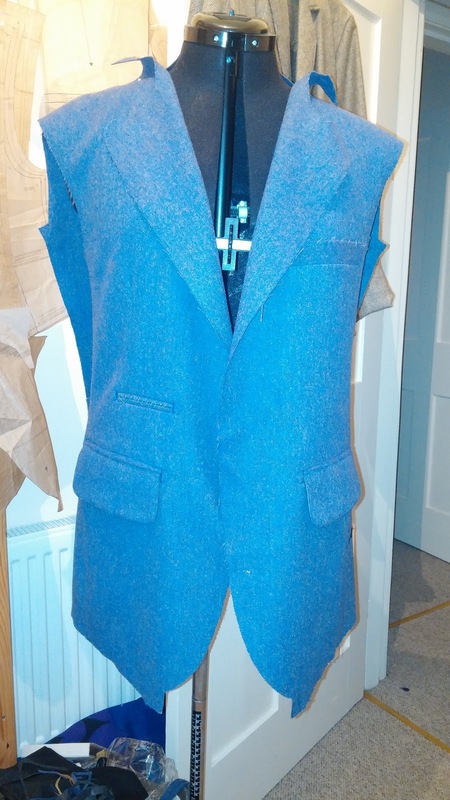 Lu’s hacking jacket is ready for lining so should be finished soon. 2. High-End Ready to Wear – this is more massed produced and where profitability comes in for a designer. The clothing is generally well made in standard industry sizes, good quality fabrics, better industrial sewing techniques go into make expensive but mass produced clothing lines. 3. Made in Bangladesh – H&M, Marks and Spencers, in the USA – target, walmart etc, clothing made as cheaply as possibly sew with the minimal amount of thread, stitching etc. The insides finishing in the garment is cheap. It promotes, cheap fast fashion for the mass market of low end consumers. As far as the work you do Jamie, I would call your tailoring – bespoke, since you take time to fit the person you are doing work for, as well as your selection of fabrics and finishes. Your clothing is custom made for each client, there are high end/couture finishing techniques that you could also employ in your woman's wear that would raise the bar to make you a true, couture designer.